We’d love your help. Let us know what’s wrong with this preview of Taming of the Shoe by Sarah Darer Littman. Arminita Robicheaux—Cinderella’s daughter—discovers that the best way to happily ever after is doing what you can to make your own fairy tale come true in this enchanting follow-up to Charmed, I’m Sure that’s perfect for fans of The Descendants! Arminita Robicheaux is convinced her parents are out to ruin her life. Not only did they move Minty to New York City right before ­Arminita Robicheaux—Cinderella’s daughter—discovers that the best way to happily ever after is doing what you can to make your own fairy tale come true in this enchanting follow-up to Charmed, I’m Sure that’s perfect for fans of The Descendants! Arminita Robicheaux is convinced her parents are out to ruin her life. Not only did they move Minty to New York City right before the school year started, but her mom’s late-night infomercials for a variety of cleaning products follow Minty wherever she goes. Oh, and did she mention that her mother happens to be Ella Robicheaux—a.k.a. Cinderella? And Minty’s eccentric aunties—who may or may not have made Ella clean and wait on them while growing up—decide to cast Minty’s entire class in their new commercial for their “Comfortably Ever After” shoe line, complete with raps that make Minty want to run far, far away. 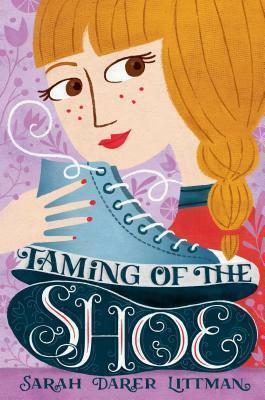 To ask other readers questions about Taming of the Shoe, please sign up. Sarah Darer Littman is the award-winning author of CONFESSIONS OF A CLOSET CATHOLIC, PURGE, LIFE, AFTER, WANT TO GO PRIVATE? and the upcoming CHARMED, I'M SURE and IN CASE YOU MISSED IT and middle grade fairy tale retellings CHARMED I'M SURE, and FAIREST OF THEM ALL. She lives in Connecticut, in a house that never seems to have enough bookshelves.